The information panel displays a collection of expandable ‘lists’ and ‘cards’ of the information that is available for this location. 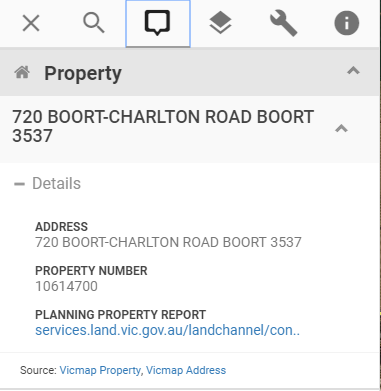 By default, the Property ‘list’ is expanded, showing a ‘card’ of the selected address. If there is more than one feature found at a location, the list displays the card headers, and you can click on the card you want to expand it. Other lists include Land Parcel, Street View, Planning Zones and Overlays, and CMA. Click on the list header to expand the list, and see the cards relating to any features in the list. If your organisation has implemented the Property System Integration module, you will be able to access live information from the organisation’s internal property database. 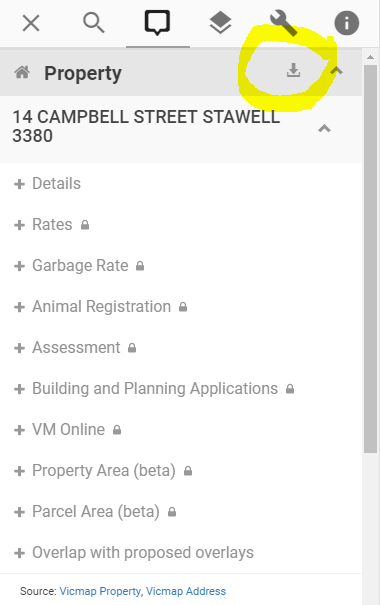 Users who are on the organisation's network can click on a property to view property-specific information such as owner details, building permits, planning permits, and animal registrations. Any part of the property card that has a padlock icon next to it means that this is private information and is only available to internal users, and is not visible to outside users. Users can download property information that relates to the linked database, such as property owner details. After selecting the target property(s), click the Download icon in the Property list to download the CSV file.